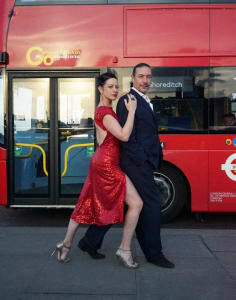 Tango y Nada Mas brings more than 25 years of experience in Argentine Tango to London through classes, workshops and performances. Tango y Nada Mas shares the Tango culture of Buenos Aires with an emphasis on the music, the embrace, the walk and social dancing. Our aim is to inspire people with this beautiful improvised dance and to build a community of like-minded dancers here in London. At Tango y Nada Mas classes focus on ‘Tango Salon’. Tango y Nada Mas remains close to the social dance, so teaching focuses on the embrace, the walk – which is the basis for everything else -, and the music without which we wouldn’t be dancing. We share our experience of dancing in the Milongas* so that those who learn with us, can also enjoy dancing in the Milongas. 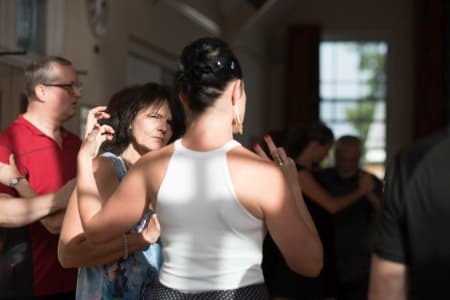 This is important as there many traditional ‘codigos’ (rules/etiquette) in a Milonga developed over time to ensure everyone can enjoy the experience. Absolutely wonderful teachers plus great music and atmosphere. AMAZING teaching. So glad I came.